SOA is short for Service Oriented Architecture. SOA is basically an architecture where there are a set of services which are typically exposed as a set of web services by one or more applications and can be invoked by webservice clients. It’s a readymade framework. For e.g.you could have a front end interface for internet banking which would invoke a remote webservice to authenticate the user on login, another webservice to get a list of accounts and yet another webservice to get account details etc. So there is this bank of services which is the SOA layer that provides information to external clients services eg. as web services. The primary motive is to decouple the producer and consumer of information so that one is agnostic about the internals of the other. So in our case, the thick browser client is invoking services on the app server. SOA is not really anything different, it’s just a design pattern or architecture. One example would be EJBs where you have a bunch of EJBs providing services and the client code will lookup an EJB and invoke a method on it.You could deploy updates to the EJBs without impacting the client code as long as the method signature doesn’t change, but mostly SOA is a set of webservices; that’s the most common usage. This is another way of decoupling business implementation from the client code. The client is only interested in getting access to that business functionality leaving the implementation to the SOA developers. That’s all there is to SOA – the implementation is quite varying. In that sense most webservices are SOA, but SOA might be a host of webservices. If you search for SOA on the internet you’ll find a lot of literature, but a lot of them won’t make sense because all vendors tout their own frameworks so instead of stating the theory they dive into the detailed implementations. Most of the literature maybe marketing stuff. JBPM terminology -> process-definition, node, state, transition, process instance, process instance id, actionhandler. This example demostrates the use of JBPM as a workflow engine. I have used the jars in the package jbpm-jpdl-suite-3.2.3.zip available on the sourceforge site. In addition to this you will need the mysql jar containing the mysql jdbc driver. I have used a standalone example to demonstrate the use of jbpm while in real practise it would require a full fledged GUI where state changes in ItemRequest would take place due to user actions. 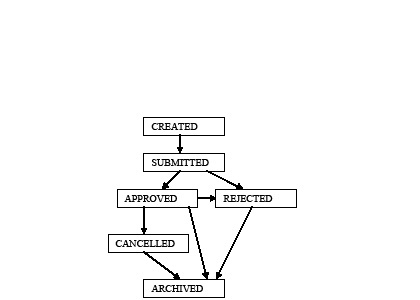 The various states that a RequestItem object can go into is shown in the diagram below and described in processdefinition.xml as a workflow. JBPM requires an initial setup in the database. JBPM tables are created in the mysql table when the following line(commented) in the main class is executed. This is a one time execution and should be run only once or whenever there is a change to processdefinition.xml. Database jbpmappdb need to be created in mysql before running the above line. Note that it defines a variable processInstanceId required for JBPM. We define two JBPM handler classes. CounterHandler keeps track of the number of ItemRequest objects in submitted state and in the approved state using two static counters whose values are printed out in the main class whenever a state change occurs. StatusHandler is also a listener which is triggered whenever status change occurs. In this app it does not do anything, but in a real app can be used to update the status of ItemRequest in the database. Many a times one needs to debug an application by printing out the state of a java bean or multiple java beans with complex inner variables which may themselves be java beans or complex data types such as arraylists. This task is simplified a lot using the gson utility. The following standalone application implements two java beans that print out their state by extending a base class that overrides Java Object class’ toString() method. In the toString() method gson is used to print out formatted state of the java bean that inherits it. The only jar I am using is gson-1.7.1.jar which has this debug utility.